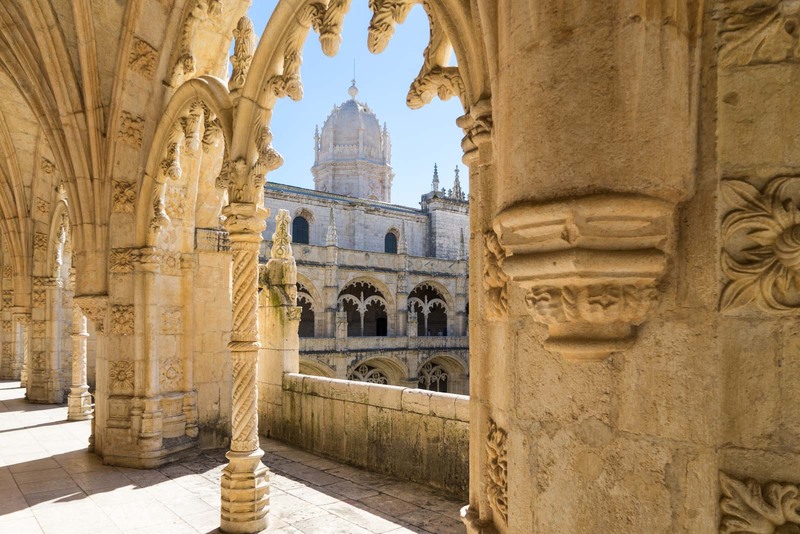 Two of the most important sights in Lisbon are Belém Tower and Jerónimos Monastery. Let me give you some background about why they are worth visiting. 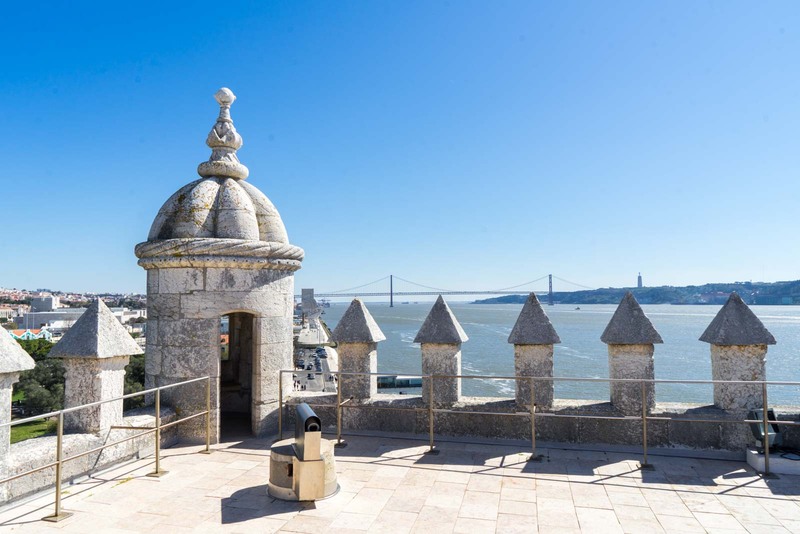 The Tagus estuary, on which the Lisbon neighbourhood of Belém sits, is a mix of the fresh water that flows down the Tagus River through Portugal and the salt water that washes in from the Atlantic Ocean. 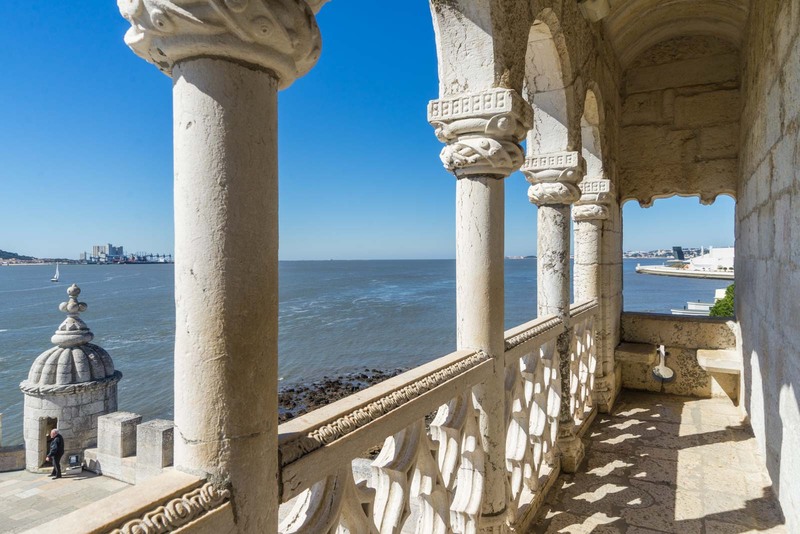 You really couldn’t have created a better metaphor for what the historical landmarks here at Belém represent – Portuguese influence flowing outwards and the consequences coming back from across the seas. 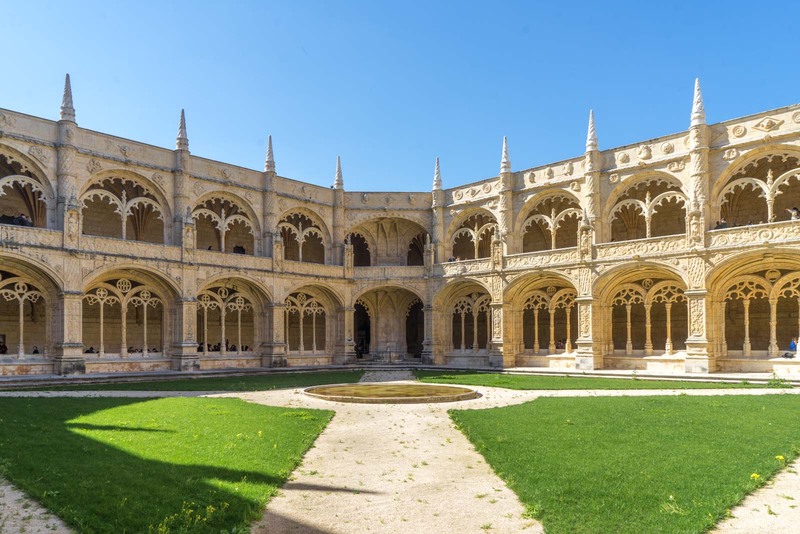 The Complex at Belém is made up of two extremely important sites – Belém Tower and Jerónimos Monastery – and is a testament to the Age of Discoveries. It’s not the best representation of the power of colonial Portuguese – that comes in the opulent Ajuda Palace. And it’s not a symbolic icon created in retrospect – like the Monument of the Discoveries. Those landmarks came much later and you can read more about them in my guide to one day in Belém. No, the Complex of Belém consists of two locations that were created at a time when the Portuguese exploration of the world was just beginning, when excitement was mixed with fear, when the unknowns offered unlimited potential and guaranteed danger. It’s easy to have an opinion now about the effects of the European race for colonisation that this Age of Discovery gave birth to. But try for a moment to imagine what it was like at the turn of the 16th century when explorers would set off from the shore here at Belém and, if they did return, bring tales of new continents. The Jerónimos Monastery (also know as the Hieronymites Monastery) has a view across a park of the Tagus River. The location is no coincidence. It was built here to be the final chance for sailors to pray for spiritual protection before they set out on the seas. Vasco da Gama, the famous Portuguese explorer who found the first sea route to Asia, prayed on this spot with his men before he set out on that voyage in 1497. But the church that was here then was already in disrepair. His successful trip was a large part of the motivation for King Manuel I to move ahead with the new building. 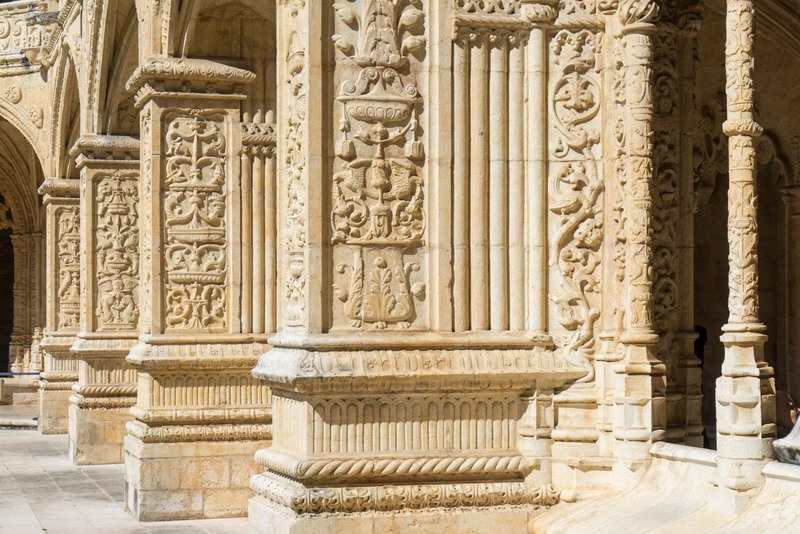 Construction of Jerónimos Monastery started in 1501 and it was completed in 1601. The king chose the religious order of Hieronymite monks to run the monastery (hence the name) and they did indeed give spiritual guidance to sailors for centuries until the monastery was abandoned in 1833. What was created was more than just a symbol of the exploration era and it was more than a home for religion. The building is also a treasure of architectural beauty. 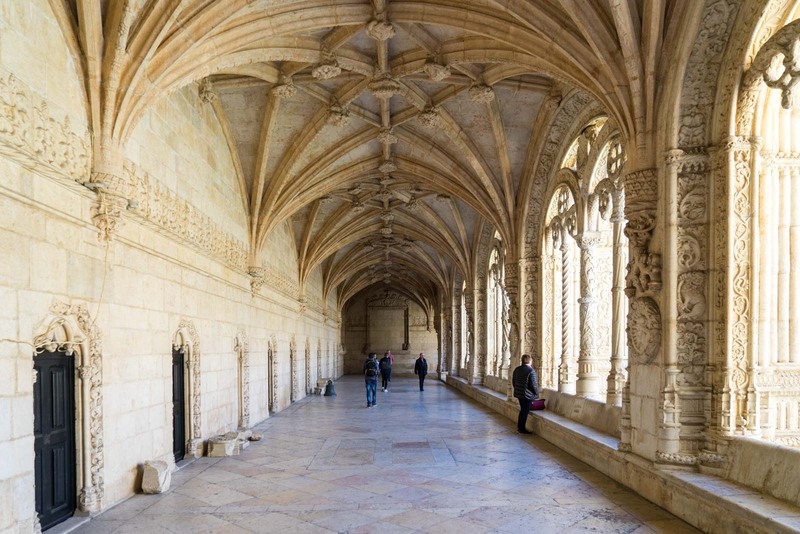 When you visit Jerónimos Monastery, you’ll quickly realise that the cloisters are the highlight. The square covered pathway sits around a grassy quadrangle over two levels, which was very unusual for the time. The arches and vaulted ceilings are full of intricately-carved decorations. Spend some time to look closely and you’ll see a combination of religious symbols, royal imagery like the coast of arms, nautical themes, and elements of nature like plants and ropes. Although you need to pay to go inside the monastery, you can visit the church that is attached for free. 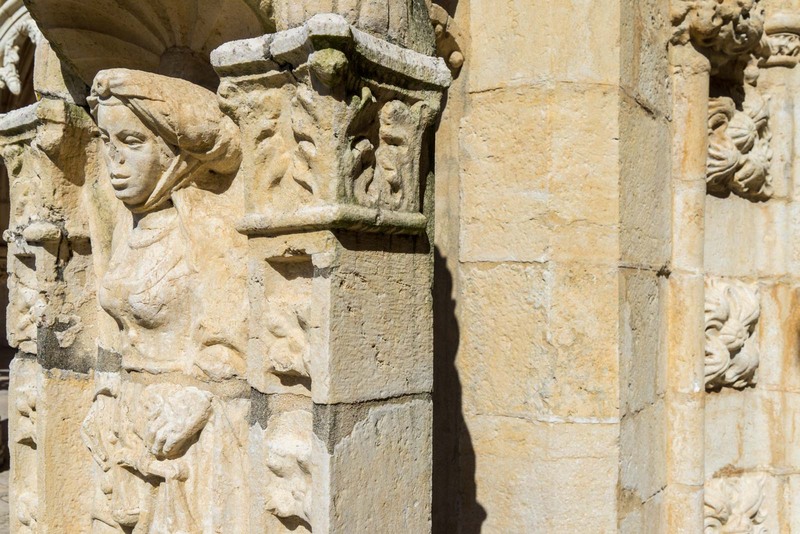 You enter the Church of Santa Maria through the western portal that, although not as dramatic as the southern portal, is still surrounded by beautiful carvings. Inside, you’ll discover that the church is much taller and longer than it seems from the outside. This is partly because of clever engineering design that didn’t need as much support as expected. On the way out, make sure you stop to see the stone tomb of Vasco da Gama. The tomb was sculpted in the 19th century and the remains of his body were moved here in 1880, nearly 400 years after he set off from this spot. 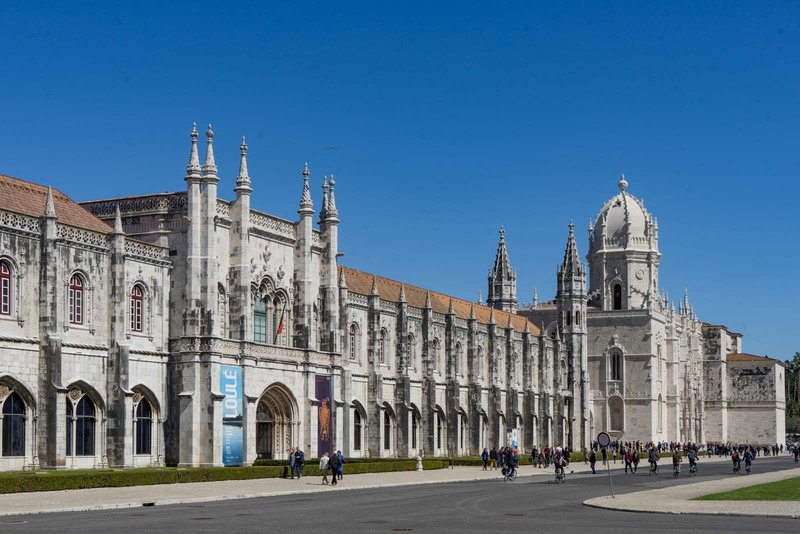 The official address of Jerónimos Monastery is Praça do Império 1400-206 Lisboa, 1400-206 Lisboa. 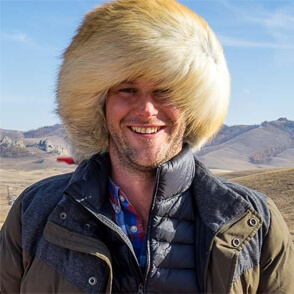 You can see it on a map here. 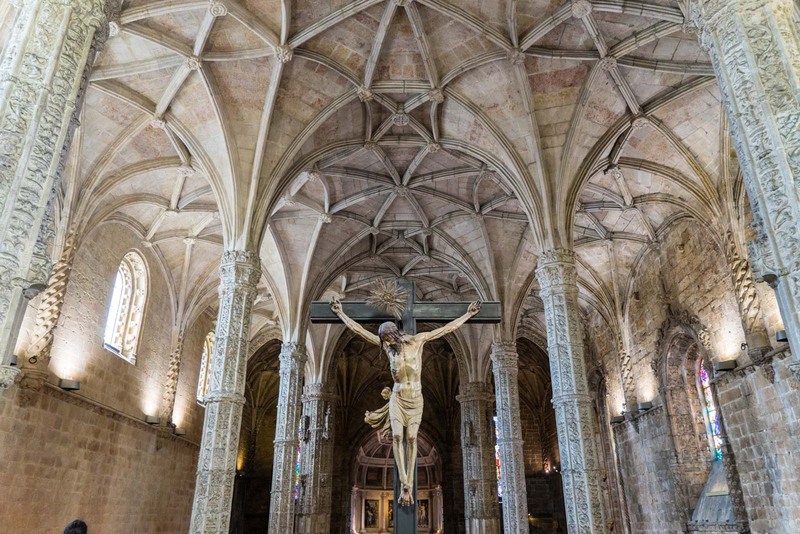 If you're using public transport, I think the best way to get to Jerónimos Monastery is by the local train from Cais do Sodre or the tram 15. Just get off at the Belém stop and it's a short walk. You can also use the city buses with the numbers 727, 28, 729, 714 or 751. The admission fee is quite high and there's often a long line to buy it. You can skip this line if you already have a ticket, so consider getting a combined ticket with Belém Tower or the Archaeological Museum next door (although the exhibition isn't that great). I also have some options for skip-the-line tickets at the end of this post. Although I also highly-recommend the Lisboa Card to save money if you're going to visit both sites, you'll still have to join the line at one of them to get a ticket - but make sure you ask for the combined one. You can see more information at the monastery's official website. While the monastery was still being built, King Manuel I embarked on another construction project nearby in 1514. 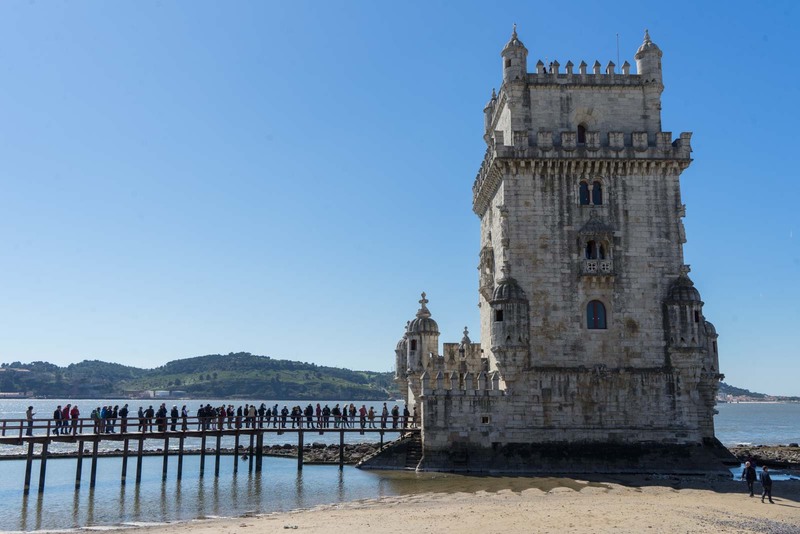 This time it was Belém Tower, a fortification that actually sits away from the shore in the Tagus River. The tower is one of the main symbols of Lisbon’s tourism industry these days, presumably because of its striking appearance. It appears to rise up from the water, strong and defiant, threatening enough to scare enemies but ornate enough to charm friends. And that was its dual purpose. Primarily it was a defensive tower that could be used to attack any ships of an invading force. But it was also supposed to be a celebration of Portuguese power and the triumphs of the country’s explorers. I have only been to Lisbon once before (about 5 years ago) and it was really just to pass through for half a day. The only tourist thing I did with my time was head to Belém Tower but it was closed when I got there so I took a few photos of the exterior and then left. What was wrong with me? Perhaps I was tired (I remember I was – I had just got off a long-haul flight). Or perhaps I wasn’t opening up my mind enough to look beyond the bricks at what the tower represents. One thing I know I definitely did wrong was not go inside. 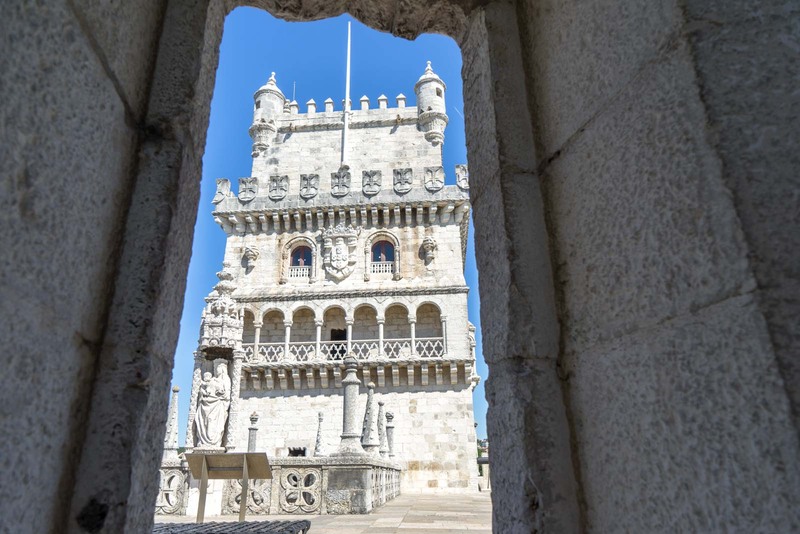 Trust me, I can tell you now that you need to go inside and climb through Belém Tower to properly appreciate it. The shape, the structure, the scale, the artistry of it all – none of it makes complete sense until you can view it from within. On the ground floor is the room where all the cannons were mounted to fire on enemy ships. From here you can also climb down into the prison cells that are dug out below the water level. Above the cannon room is the large terrace that gives you a beautiful perspective back onto the tower that you can’t see from land. As you climb up the tower, you’ll find the rooms on different levels that are quite regal and have been used for various official purposes over the centuries. 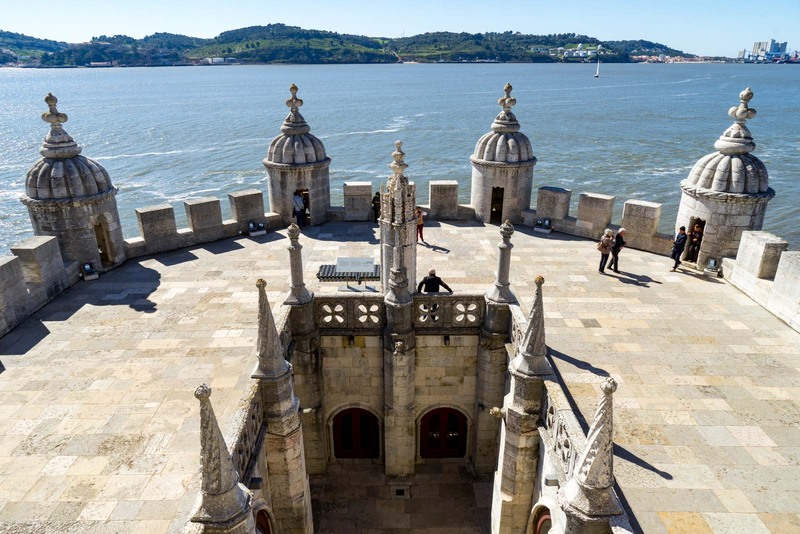 Finally, from the very top you’ll get wonderful views of Belém and the Tagus River in both directions. Look to the east to see the fresh water coming from Portugal, and to the west to see the salt water coming in from the seas to discovery. Belém Tower is on Av. Brasília, 1400-038 Lisboa. You can see it on a map here. 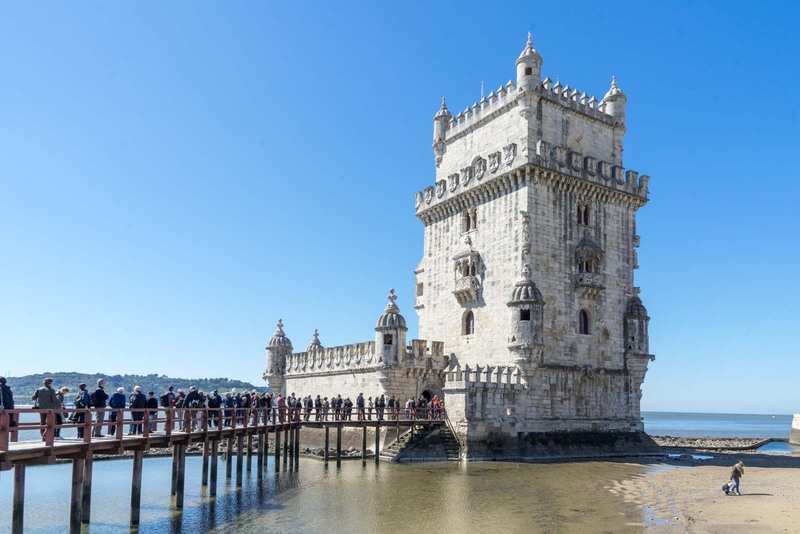 If you're using public transport, I think the best way to get to Belém Tower is by the local train from Cais do Sodre or the tram 15. Just get off at the Belém stop and it's a short walk. Because the number of people inside the tower is restricted, there's often a long line. I have some options for skip-the-line tickets at the end of this post. 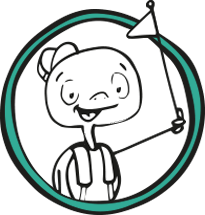 You can find out more information at the tower's official website. 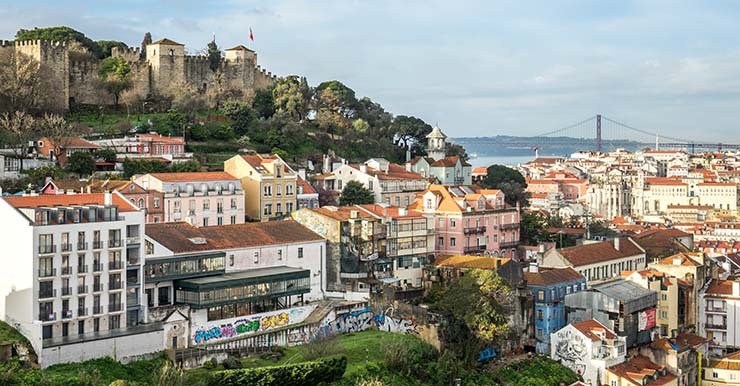 I would highly recommend you put these two sites on your itinerary for your time in Lisbon. 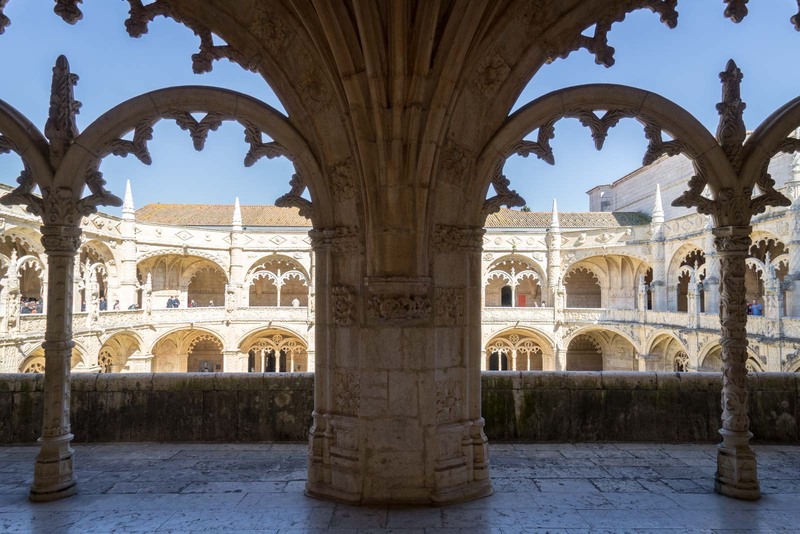 The city doesn’t have a lot of famous historical sites that you’ll feel compelled to see, but Belém Tower and Jerónimos Monastery are worth the time. I’ve included some practical information about visiting but I want to stress the value of using the Lisboa Card for visiting these sites. A 24 hour card is about the same cost as seeing the monastery and the tower plus public transport to get there – and you’ll still be left with more than half the day to use the card to see things for free! 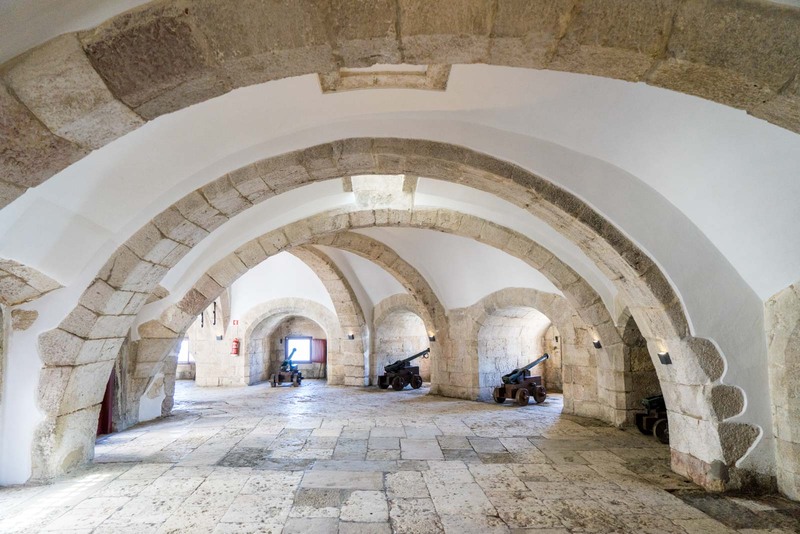 There’s actually a lot to do here in the Belém neighbourhood than just these sites. If you’re interested, I have put together this guide on how to spend a day in Belém. Thank you so much for the amazing stories about your travels. Your pictures looks adorable. I really like this type place to explore. What a great architecture of these building. Lovely!! What an amazing architectural beauty it is. Loved it! Thanks a ton for sharing. Such a awesome post! What a great architecture of these buildings. you captured really great pictures in your travel trip. Thank you so much for sharing it. Keep sharing! Great article. Enjoyed reading it with our homeschooler today.